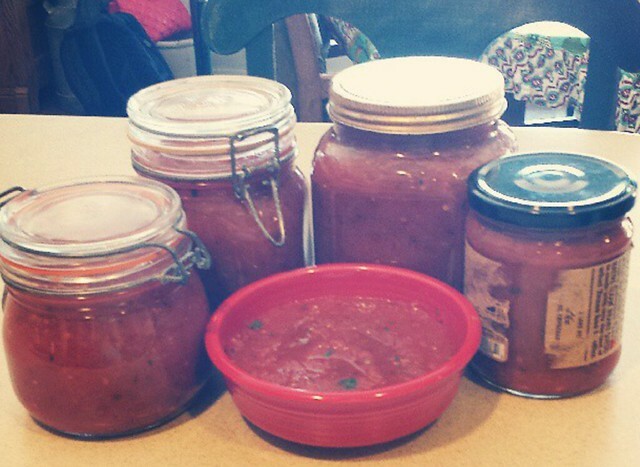 I am truly embarrassed at how much of my life I spent buying salsa instead of making it myself. Homemade is fun, it tastes better, it’s cheaper, and totally customizable! I typically double this recipe and fill many jars to store and give away, but even the recipe as-is will give you a good amount. Start with the base and then taste and add things as needed, especially peppers. I make mine in the food processor, but I’ve done it in a blender in a pinch – you just have to do smaller amounts and stir together. I generally start with the big can of the tomatoes and one can of rotel to break it down, then move a good amount to a mixing bowl just to free up some space in the food processor. If you don’t, some of the garlic and onions tend to get lost and don’t break down, but you won’t find them until you’re pouring it into jars and it will irritate you. 1. Process the tomatoes and one of the cans of rotel until they reach the desired consistency. Pour half of the mixture into a large bowl. Then add the other can of rotel, the onions, and garlic, and process until all of the garlic and onion bits are broken down adequately. Add half of a jalepeno (the whole jalepeno if you know you want it hot), and the spices. Blend again. Add the cilantro leaves and lime juice, blend again. 2. Pour everything else into the big bowl and stir to combine. Give it a taste – add more jalapeno, salt, garlic or lime to taste. Store in jars in the refrigerator. If well sealed, they will last a few months. If you need it to last longer, I’d recommend freezing.